Hey all, just a quick post to announce a competition I'm running in the wake of Rogers 7th Wimbledon title and to give you the perfect preparation to get psyched for the US Open that starts at the end of the month. 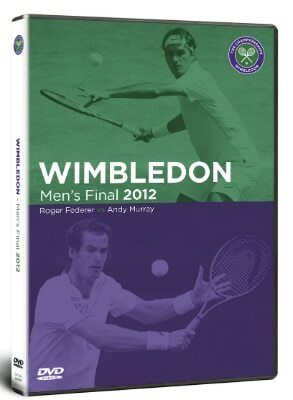 Thanks to the AELTC, that's the guys who run Wimbledon to you and me, I have 5 copies of the Official 2012 Men's Final – Roger vs Andy Murray DVD to giveaway!. This is a full HD quality re run of the final so you can relive the moment whenever you want, far easier than having to YouTube highlights or trying to download a low quality torrent that takes days! This is a straightforward competition, to be in with a chance of winning all you have to do is enter your email in the box below and once I close the competition I'll draw 5 winners at random, contact you and then get the DVD's posted out to you. I should also add this is a Region 2 DVD, i.e. its been authored to play on European DVD players. It will also play on multi-region DVD players. But I'm pretty sure there's numerous ways for it to work outside the region. Closing date for the competition is the 31st August so get your entries in! It's open worldwide, 1 entry only per person. Remember once you enter your email you will get an email asking you to confirm your entry, remember to do that otherwise you won't be on the list! Oh and if you can't wait for the competition or you miss out; you can buy the DVD from Amazon by clicking this link. Any questions let me know in the comments and good luck! GREAT! YOU GIVE ALWAYS SOMETHING SPECIAL! I’m out of the competition, but it is a WONDERFUL GIFT! Cheers Ana, how come you’re not entering? Nope, it’s open worldwide (just amended the post to reflect that). If you have an address then you’re good to go! OK, THANK YOU! I WILL TRY! 🙂 Best Regards! Not only do you write excellent blogs, but you also give rewards to us Fedfans who follow Fed through the brilliant but sometimes tough career he’s had. Thank you! Jonathan, thanks for your present for your fans. We know, there are so many people who would want to make profit by selling them but you are the one who wishes to make FedFans happy. I’m so proud to be a fan of Roger and you. Thanks for the kind words, and good luck if you entered! So was this sponsored by the AELTC? Pretty cool. Yeah the giveaway is courtesy of them. Good gesture. hmmmmmm so this would b wonderful.hope i get this.m a extremely huge roger fan.last week when i was sick to cheer myself i wrote abt six poems on roger.and i was surprised all of them wer real good.and perfectly rhyming too! Why don’t you write one of the poems here? I have a VHS recording of this 2012 Wimbledon Final, and the quality is excellent. It contains extra build up that is probably not seen on the DVD. VHS may be a very declining medium, but this HI-FI Stereo recording of the live event is still worthy as an archival alternative. I used to like buying videos, something strangely entertaining about rewinding them but DVD was always gonna wipe them out. Won’t be long before the DVD is dead too I think, all about the stream.